Tip-on gatefold sleeve; Includes liner notes. 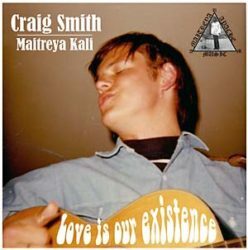 Craig Smith was an extraordinarily gifted songwriter and musician who seemed poised for a successful career in the 1960s music business until his life was derailed by drugs and schizophrenia. In 1969 clean-cut, charismatic Craig Smith became Maitreya Kali, a dark, disturbed psychedelic Messiah figure with a black widow spider tattooed on his third eye. He laid out his strange vision on a self-released double-album Apache/Inca (1972), which would become a sought-after artifact of the psychedelic era. Success came easily for Craig Smith. In 1963, right out of high school he became a cast member of the popular Andy Williams TV show as one of the Good Time Singers, a wholesome folk ensemble that recorded for Capitol Records. Next he landed one of the lead parts in a new TV show, The Happeners, about a Greenwich Village folk group. But when the TV pilot was not picked up, he set out on his own musical path with the folk-rock duo Chris & Craig and then the more psychedelic Penny Arkade, produced and managed by Mike Nesmith of the Monkees. Throughout this period Smith was constantly writing songs, some of which were recorded by other artists, including the Monkees (“Salesman”), Andy Williams (“Holly”, “Christmas Holiday”), the Robbs (“Rapid Transit”), and Glen Campbell (“Country Girl”). But soon afterwards, his life took a dark, terrifying turn. Turning to LSD and Eastern mysticism he journeyed through Asia along the hippie trail where he was brutally attacked, raped, and left for dead. He was never the same again. As Maitreya Kali, he self-released the now legendary Apache and Inca albums in 1972 before disappearing into the shadows. He spent much of the 1970s in prison or in mental institutions before eventually drifting into homelessness on the streets of Hollywood. He died in his sleeping bag in North Hollywood Park in March 2012. Craig’s older brother Gary contacted Stax with a trove of unreleased music. The best of those songs are presented on Love Is Our Existence. Professionally recorded in Los Angeles studios between 1966 and 1971, these previously unheard songs reveal a singer and songwriter of breathtaking depth and talent. Remastered from acetate discs and master tapes.